Bali, also known as Mahabali, was pushed down to the netherworld or Patala. He ruled the underworld and his fame one day reached Ravana. An arrogant Ravana went to the Patala to challenge King Bali. The story of how Ravana got defeated by King Bali in Patala is found in the Lanka Kanda of the Ramacharitamanas of Tulsidas. The story is narrated by Angad, who went to Lanka as the messenger of Bhagavan Sri Ram, to avert the war. A haughty Ravana was reminded by Angada as to how he was defeated in Patala. Ravana reached patala to defeat and conquer Mahabali. But children in the palace captured Ravana and tied him up along with the horses in the stable. The children teased and made sport of him. They thrashed him and kicked him. Finally, King Bali took pity on the demon king and released him. Apart from this episode, Ravana was also defeated by Lord Shiva, King Vali (brother of Sugriva) and by Sahastrabahu Arjuna. 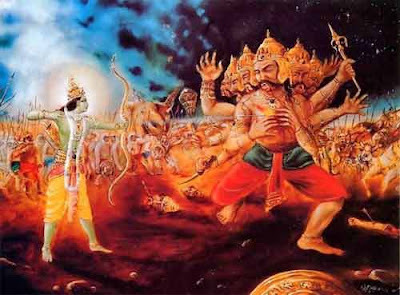 Finally, Ravana was annihilated by Bhagavan Sri Ram and his Vanarasena led by Sugriva and Hanuman.